TSH Newsroom: You are doing it all wrong!! Can Micro Management help make your warehouse more efficient? Merriam-Webster's Online Dictionary defines:Micro Management as management with excessive control or attention on details. While it is much maligned, in some instances micro management may offer a solution to help you make your warehouse operations more streamlined. According to industry statics, order picking costs typically account for more than 50% of total warehouse / DC operating costs. With the trend toward smaller, more frequent orders, order fulfillment costs will continue to increase. Naturally companies are concerned and searching for better management methods to combat this growing problem. Many companies consider deploying a separate Labor Management Software (LMS) to help improve their bottom lines. With the MDS-WMS system the Labor management suite is integrated so a separate LMS is not required. The simple result is often a labor productivity increase simply because employees know they are being tracked throughout the operation. But, distributors should be mindful that tracking time per pick isn't a one-size-fits-all proposition. Based upon our experiences, large distributors with 15 or more order pickers often benefit most from LMS and Time tracking. The problem is seems its that for the majority of small distributors, order pickers are multi-tasking. These people perform multiple different tasks, not at the same time, but going from picking to a completely unrelated tasks as they work. To simply record when they start and stop would not really track the true time to pick. Based upon that here are some micro-management suggestions that can improve order fulfillment productivity and lower overall operating cost without tracking specific times on operations. All of these are easy to implement using the existing MDS-WMS system or can be done manually if your system doesn't support these capabilities. Single-line orders generally can be picked in large batches. Because they don’t need to be consolidated with other items, they often can be picked directly into a shipping carton or envelope, thereby, eliminating the packing and sorting function altogether. In a parcel-shipping environment, single-line case orders could be batched to allow operators to pull a full pallet or case, and then print & apply customer specific shipping labels to the individual cases. That's great for the customer, but what about the warehouse? Piece picking will likely increase warehouse order fulfillment cost. But rethinking order fulfillment processes to optimize "each-picking" tasks could yield significant productivity improvements in both the warehouse and the customer stockroom. Start by thinking about the final destination of the inventory inside the stockroom. The small orders that are created by increased delivery frequency, for example, can be further divided to match shelves, aisles or stockroom layouts. Several of these "sub-orders" can be picked simultaneously as an efficient batch in a single pick trip at the warehouse. Loose pieces also can be bagged and labeled with the pick ticket at the warehouse. As a result, the stockroom will receive products grouped and identified. Meanwhile, the pick path for the batch can be greatly reduced if products are slotted at the warehouse to mimic the way that orders are received from the customer. 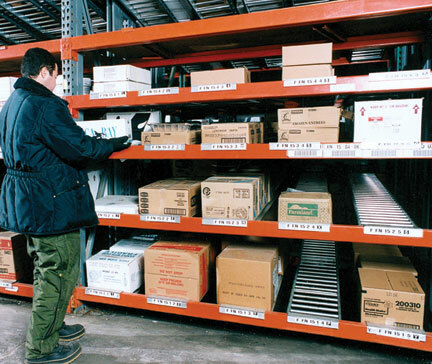 This will allow you to choose optimal picking configurations in the warehouse. Assuming your customer orders are automated and regular this can be a tremendous time saver for picking. If you really need to push throughput the MDS-WMS system can work with hardware based product-to-person picking methods, like horizontal and vertical carousals, which increase productivity within a minimum footprint. (3) Look For Order Patterns and Slot Items Based upon It. When it comes to multi-line orders, sometimes pickers are fortunate enough to pick an entire order without travelling far on the pick path. How can you make that the rule rather than just a matter of luck? The RemoteNet system now offers the ability to created suggested items when brwosing for a product, similar to Amazon's recommendations. Applying that same logic to your picking and slotting strategy means that you can now predict which items will be on the next order and slot accordingly. Generally, if you begin picking all portions of an order at the same time, full-case items will arrive at the dock first. That's because broken-case or each picking is labor intensive and typically slower. while at the same time allowing piece pickers to pick the remaining items. How much better, and less expensive, would it be to pre-pick eaches into shipping containers and stage those containers in a flow rack or shelving area? When all the eaches picking has been completed, crank up the case-pick line and let the eaches containers lead the cases straight into the truck.